Origin: Southern Guanajuarto to central Jalisco to the Pacific Coast, and on to the narrow plains of northwestern Michoacan and Tres Marias Island. Habitat: Coastal bush areas and tropical forests. The red rings of Nelson's milk snake number 13 to 18. It has a predominantly black snout and very little white flecking. Cages should be escape proof, complete with water and hiding area. 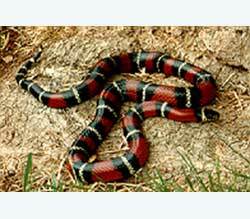 Kingsnakes and milk snakes must be housed separately (except during breeding season) because they are cannibalistic. Inexpensive enclosures such as plastic shoe or sweater boxes work well if there are ventilation holes drilled in the sides. Aquariums or home-made enclosures also work well if you want to display the snake. A variety of substrates may be used (aspen shavings, corn-cob-type rodent bedding or newspaper) to keep the animals clean, warm and dry. Kingsnakes will feed on just about anything. They will consume warm-blooded prey such as rodents and birds, as well as cold-blooded prey such as lizards and frogs (in addition to other snakes). Many species adapt well in captivity if kept between 80 and 85 degrees Fahrenheit, with a nighttime temperature drop of five to 10 degrees. Temperature control is important as it maintains feeding response and digestion.